Did you know toothpaste has some more interesting uses other than making teeth sparkling white. Read on to know some tips but be sure you are using white paste not that gel one. 1. Goggles, mirror, diving mask or any other glass item can be cleaned efficiently with toothpaste. Just apply small amount on glass surface and wipe it off with lint free cloth. 2. To get rid of nasty smell of garlic, onion and fish from your palm just rub small amount of toothpaste thoroughly on your palm and wash with water. 3. Toothpaste works wonder on minor burns (please note not open wound). For instant relief and cooling effect apply toothpaste on the affected area. 4. Toothpaste can sparkle silver, brass and metal jewelry also. Apply small amount on brush and brush it gently on the metal surface let it dry, rinse it with water and wipe with cloth for shine. It will turn grungy metal into shiny one in no time. 5. Crayon marks on wall is way too difficult to take out. No need to worry as toothpaste can do it for you. Just a dab of it on crayon mark and then rub it gently with wet cloth and let it dry. But be sure that your wall paint allows you to do it, sometimes paint can fade and glossy wall can look less shiny. So better apply on small area first and then see the result. 6. You can clean your iron too. Yes those black patches on your iron can spoil your cloths. Apply toothpaste on iron's surface and scrub gently. Your iron will look new. 7. Now for some clean and clear skin. Apply small amount on pimples, insect bites or bee sting leave it overnight and wash it off in the morning. It reduces blemishes very quickly. 8. To get rid of sour milk smell from baby's milk bottle, take toothpaste on sponge and apply inside the bottle rinse it properly. 9. It can make your sink shiny. Just apply toothpaste all around the sink, faucet and drain, rub it and rinse properly, Sink not only will shine but will smell good also. 10. Take little amount of toothpaste on brush and brush gently on finger nails and toenails. It will make them shiny and healthier. 11. Toothpaste works well in removing stains from cloths and carpet also. Apply small amount on stain rub it vigorously and then wash in washer. Don't use this on bright colored cloths. 12. Apply elbow grease, water and toothpaste on furniture and then wipe off with cloth. Your furniture will shine like never before. 13. Sometimes we see those water rings on tables and are too tough to get rid of. Just a tiny drop of toothpaste and rub it off with cloth. 14. You can bring those scratched CDs and DVDs again to life by applying toothpaste on scratched side of CD/DVD and rub gently in circular motion then wipe off. 15. Toothpaste works wonder on scuffed up leather items and sneakers. Apply small amount on the surface with brush , rub it and then wipe it with clean cloth. 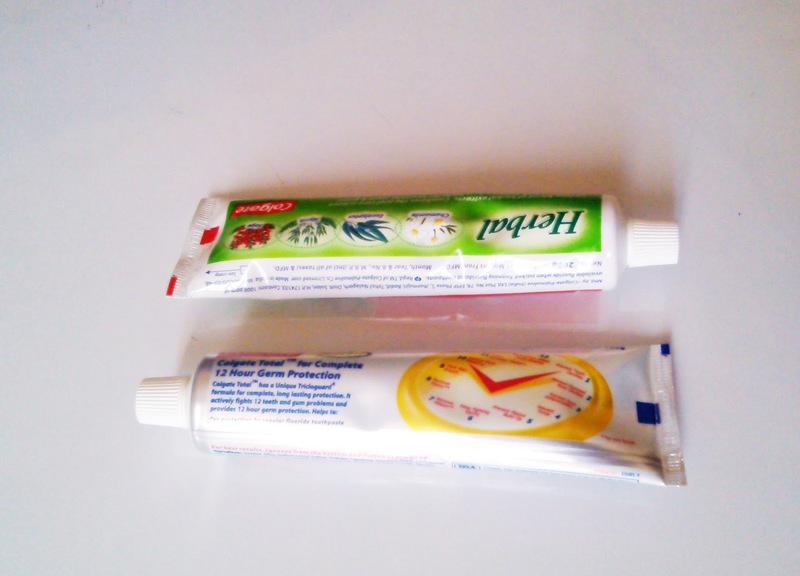 So please take care of sensitive surfaces and areas before using toothpaste. Its always good to run small patch test before using it on skin, bright colored cloth & bold colored or glossy walls. Joining Show And Tell Friday!!! Thanks Sudha!! I think cleaning metal with toothpaste is the most known unusual use of it. wow...never new toothpaste has so many great other benefit than cleaning teeth :) nice post. Thanks Disha for awesome post......I have used few of them. There use for crayon and CDs is new to me. Thanks again. Thanks a lot!! I am glad that you found some new uses of toothpaste. Thanks for dropping by!! That's wonderful that you learned a some new tips.